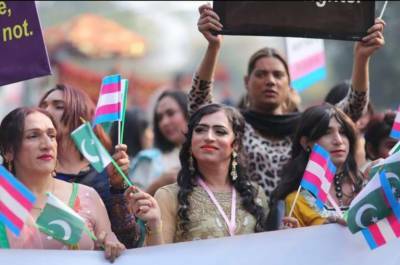 LAHORE – On Saturday, 29th December, Lahoris celebrated the new year by hosting Pakistan’s First Trans Pride Parade. 2018 has been a very fruitful year for the Transgender Community of Pakistan in terms of recognition of Trans Rights and sensitization. Ms. Jannat Ali (Program Director Saathi Foundation) led the pride march. According to her, this is just a small appreciation to those who have worked hard for the rights of transgenders, and also, it is to remember those transgender people who lost their lives in hate or discriminatory crimes. The event kicked off with a press conference by the activists leading the march. The march itself attracted a big crowd, as they took to the streets through the second most populous Pakistani city.